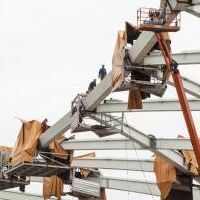 On Saturday a 22-year-old worker installing roof sheets atop Arena da Amazonia fell to his death from 35 meters. The tragedy brought work to a stop for Sunday, but all procedures were to restart today. However, following the prosecutors appeal, local labour court decided to ban all works in height indefinitely. The ban will be lifted only once the general contractor, Andrade Gutierrez, gives assurance that all workers follow safety protocol. Labor officials are expected at the construction site on Monday to evaluate safety conditions, but a local union has already said workers are expected to go on strike to complain about inadequate measures. The company running works declined to comment so far. It’s not clear whether the crisis would negatively influence delivery time that has already been postponed from end of December to late January. The new deadline is a breach of FIFA-set deadlines, but still gives enough time to run test events at the stadium ahead of the 2014 World Cup.